Members of the eighth-grade Blanchester Middle School teams who took part in an Academic Quiz Bowl. Members of the eighth-grade East Clinton Middle School teams who took part in an Academic Quiz Bowl. WILMINGTON — Nearly 50 eighth-grade students from Blanchester and East Clinton Middle Schools recently competed in an Academic Quiz Bowl competition at Southern State Community College’s campus in Wilmington. The double-elimination tournament, sponsored by the Southern Ohio Educational Service Center’s (ESC) Gifted Services Department, challenged students with a range of academic questions in a quick-recall format. Moderators posed questions that challenged students in the areas of art, literature, history, mathematics, social studies, science, sports, geography, computer science, and music. Students showcased their talents and academic strengths, and the competition encourages students to consider participating on their respective academic team once in high school. 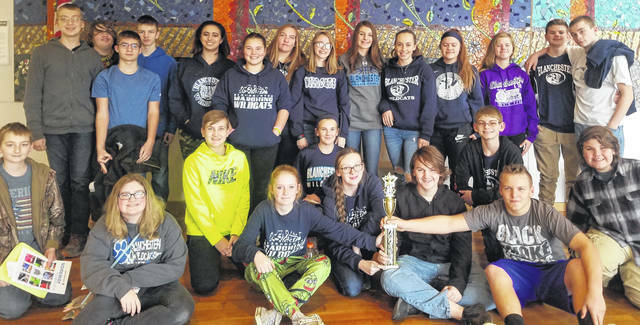 One team from Blanchester Middle School finished the tournament as champions and earned the top prize and received the coveted traveling trophy to display at their school. First-place team members from Blanchester Middle School included Rebekah Davenport, Josh Elliott, Cody Kidd and Kaylie Paugh. The reserve champion team, also from Blanchester, followed close behind. The second-place team members included Emma Damewood, Zoey Hupp, Regan Knight and Katelynn Whitt. Members of the eighth-grade Blanchester Middle School teams included Briana Addington, Michael Blanchard, Bradley Brown, Abigail Buxsel, Nathan Campbell, Emma Damewood, Rebekah Davenport, Josh Elliott, Ty Goodwin, Tyler Grillot, Zoey Hupp, Cody Kidd, Regan Knight, Makayla Lanham, Hailey Mulvihill, Alex Napier, Kaylie Paugh, Summer Schutte, Evan Strunk, Garrett Tijsma, Ainsley Whitaker, Katelynn Whitt, Zach West and Nolan Wood. 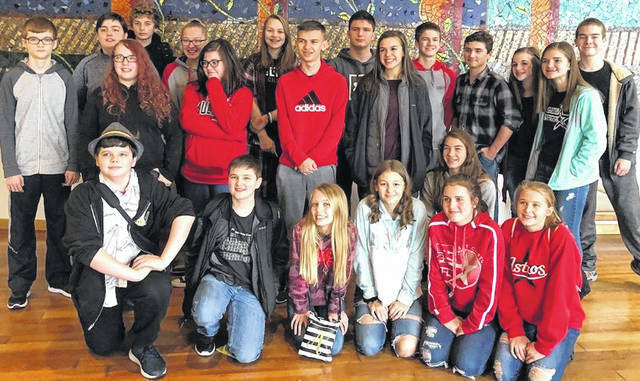 Members of the East Clinton Middle School eighth-grade teams included Trinity Bain, Dillon Bailey, Holden Balon, Kolin Brown, Dakota Collom, Haylee Cooper-Riehle, Maddison Davis, Nathan Dunn, Elizabeth Evanshine, Lex Frye, Katelin Faulkner, Brady Gaddis, Dallas Harner, Ethan Kessler, Timmi Mahanes, Aubrie Simpson, Savannah Tolle, Megan Tong, Regan Watkins, Kami Whiteaker and Colton Woods. A seventh-grade tournament and another eighth-grade tournament are scheduled to take place between Blanchester and East Clinton students later this school year. Twelve teams participated in the most recent tournament that consisted of a series of 23, 16-minute rounds, moderated in three competition rooms by Coordinator of Gifted Services Curt Bradshaw and Gifted Intervention Specialists Regina Gerber and Shelly Wellman. Karen Carter, Joyce Kelly and Laura Sizemore served as scorekeepers and timekeepers for the competition. The Southern Ohio ESC and participating school districts appreciate the support of the Robert E. Lucas Memorial Fund grant program through the Clinton County Foundation to help support the purchase of tournament equipment. Information for this article was provided by Curt Bradshaw, who coordinates gifted programs and services for Blanchester and East Clinton Local Schools through the Southern Ohio Educational Service Center.